The peace terms had been agreed six hours earlier, but the thunderous noise of heavy artillery fire — and the potential to end yet another human life — continued to the last moment. The sounds were never recorded, but we do have a visual record of the sound. And now, you can actually hear it. 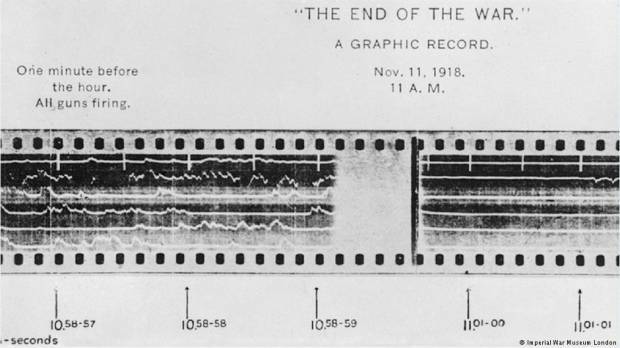 Even as the armistice came into effect at 11 a.m., Allied soldiers were using state-of-the-art "sound ranging" techniques to detect the location of the enemy. Rather than recording sound, the system recorded the noise intensity at any one moment onto a rolling piece of photographic film, similar to how a seismograph records tremors in the earth. Britain's Imperial War Museum, which had a set of graphic records labelled "THE END OF THE WAR" among its artefacts, asked sound experts from the London acoustics firm Coda to Coda to use just such a photographic record — from the American front on the Moselle — to reproduce a soundscape of the moment of armistice. Why were the films even made? Strings of microphones, set far apart, were used to detect the sound from a particular piece of artillery. The sound of any large gun being fired would be picked up by all the microphones – even if they were kilometers apart. Crucially though, they would be picked up at different times. If you knew where the microphones were, and the time differences, you could work out where the gun was. "This document from IWM's collections gives us a great insight into how intense and chaotic the barrage of gunfire must have been for those fighting on the western front," said Will Worsley, Director and Principal Composer at Coda to Coda. "We hope that our audio interpretation of sound ranging techniques... enables visitors to project themselves into that moment in history and gain an understanding of what the end of the First World War may have sounded like." The full three-minute piece documents the sounds from 10.58 a.m. to 11.01 a.m. on November 11, 1918. Visitors to the Imperial War Musem in London can hear it in full. The installation, part of the museum's Making a New World season of exhibitions, features a sound bar that visitors can place their elbow on to experience the rumbling, as well as the sound.